This one is a tradition on Derby Day at my house. 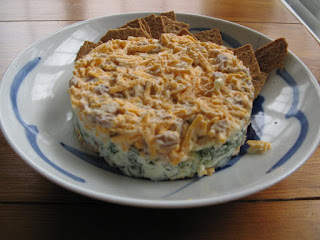 Combine 4 ounces of cream cheese with the minced spinach in a bowl and mix well. Stir the chutney into the remaining cream cheese in a separate bowl. Combine the Cheddar cheese, mayonnaise, pecans, onion and Tabasco sauce in a third bowl and mix well. 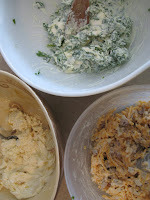 Layer half of the Cheddar cheese mixture, the spinach mixture, the chutney mixture and the remaining Cheddar cheese mixture in the order listed in a 2 cup mold or container. Chill, covered for 8-10 hours. Invert the mold onto a platter lined with additional baby spinach. Garnish with grapes and strawberries. Serve with assorted party crackers. So, today, I doubled the recipe and made two. One for today and another for tomorrow! Here is my ignorance showing. Is this an appetizer? Like a dip? Or an entree you eat with a fork? Is that really dumb to ask? I always thought torte was sort of a dessert. The spinach had me rethinking that though. Can you tell I don't spend a lot of time in the kitchen? Gosh! I did it again! It's like a cheese ball. Yes, it's great with crackers. That's how I serve it. I should have learned my lesson with the last one! You could also serve with veggies, too. Yes, a torte is probably usually a layered desert...I think they call this one a torte because it's layered, as well. In real life, it is a lot prettier than that picture. I didn't think it looked very good. Thanks! I like the veggie idea.